The tenth annual Dog Ears Bookstore Gala will take place from 7 to 11 p.m. Saturday, April 21, in the Buffalo Irish Center, 245 Abbott Road, South Buffalo. This year’s theme is “Buffalo’s Small Plate Debate II,” featuring an incredible array of appetizers from several Western New York restaurants. 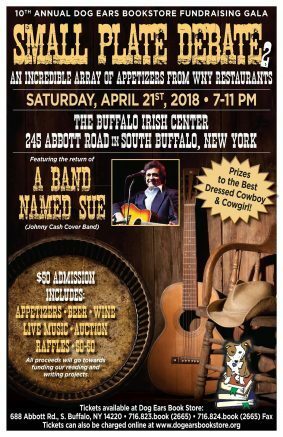 Providing musical entertainment for this country themed event will be A Boy Named Sue, a Johnny Cash cover band. Admission includes appetizers, beer and wine, and the event will also feature an auction, raffles, 50-50 drawing and more. Prizes will be awarded to the best-dressed cowboy and cowgirl. Gala tickets are $50 and are available in advance at Dog Ears Bookstore & Café, located at 688 Abbott Road, Buffalo. A limited number of tickets will also be available at the door. This is a 21 and older event. For more information on the nonprofit bookstore, please call 823-2665, visit www.dogearsbookstore.org or follow Dog Ears on Facebook for frequent updates. Be the first to comment on "Dog Ears Bookstore plans 10th annual gala event"